The images are hard to watch -- vulnerable, elderly residents of Texas nursing homes beaten and abused by their caretakers. The abysmal care is more than anecdotal. Using data from the federal Centers for Medicare and Medicaid Services, WFAA discovered the patient abuse rate in Texas nursing homes is nearly four times the national average. But there’s a heartbreaking story behind these numbers. News 8 investigator Charlotte Huffman spent months analyzing state data, and made a disturbing discovery: violent criminals are working as certified nursing aides (CNAs), and in many cases, it’s legal. “I don’t understand it,” said Liz Harris, recalling what happened to her sister, Mary, at The Rehabilitation & Wellness Centre of Dallas on Live Oak Street in Dallas. These days, Mary is in a brighter place, a new nursing home, but she still remembers that night two years ago. Instead, she said, her CNA sexually assaulted her. After the incident, Mary was taken to Parkland Hospital. She tested positive for a sexually transmitted disease. At the time, she was 66. Chandler McCaughan also trusted a nursing home to protect his mother. At the Windsor Nursing and Rehabilitation Center of Duval near Austin, CNA Carlos Santacruz was caring for McCaughan's mother, or so he thought. “Instead he's taking pictures of her you know wiping feces on her face,” he said. Santacruz was fired and charged with injury to the elderly after he posted pictures on social media in which he tickled the sleeping 83-year-old’s face, prompting her to smear feces on herself. He recently pleaded to assault against elderly, records show. Despite WFAA attempts to reach him via email and social media, Santacruz couldn't be reached for comment. Both these victims have one thing in common: Both nurse aides had a previous prior criminal record. Santacruz was previously arrested for fraud and drug possession. Shead confessed to two counts of assault causing bodily injury. The nursing homes hired them anyway. Because in Texas, they can. The nursing homes hired both of these nurse aides with criminal histories legally. Because of loopholes in Texas regulations, you can plead guilty to a serious and violent crimes, yet still become certified as a nurse aide. 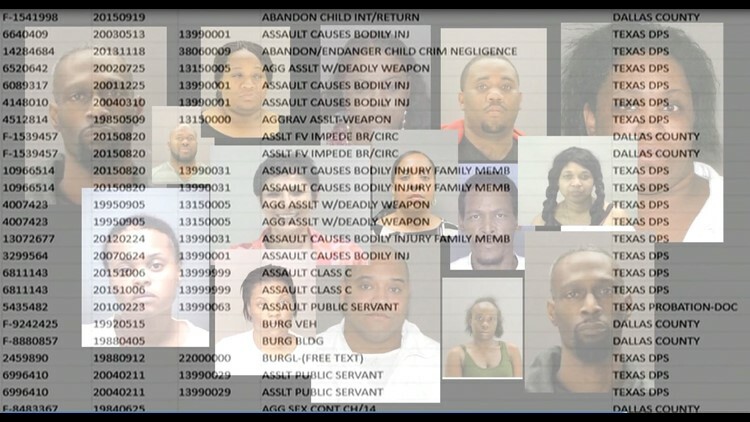 WFAA’s investigative team identified nearly 200 such nurse aides in North Texas alone, all with serious or violent criminal pasts including continuous sexual assault of a child, injury to the elderly, aggravated assault with a deadly weapon and robbery. All remain certified and eligible to work as CNAs in Texas. “For the nursing home industry, it's all about money,” said Ernest Tosh, an attorney who handles nursing home abuse cases across the United States. He’s known as an expert in the field. WFAA contacted both nursing homes named in our story. Windsor Nursing and Rehabilitation Center of Duval officials declined comment. Officials and the civil attorney representing The Rehabilitation & Wellness Centre of Dallas failed to respond to WFAA requests for comment.